A Rup Life received a sample product for this review. This post contains affiliate links. For this month's Moms of Masterbooks review we received two awesome DVDS! Awesome Science Explore Glacier National Park with Noah Justice and Explore Rocky Mountain National Park with Noah Justice. 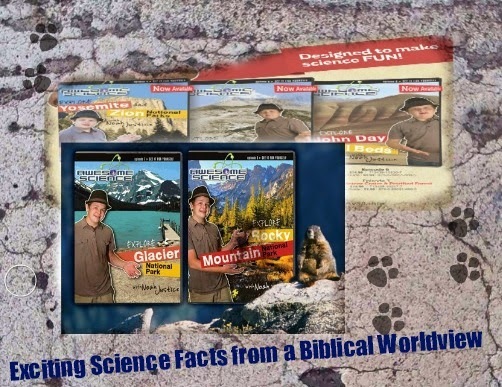 Go on a field trip to see natural wonders and explore evidence that supports the Biblical record. As homeschoolers we are always looking for way to enrich our studies. My 8th grader is currently studying geology with his general science curriculum so these dvds were a great addition. Both have a strong creation science view which fits right in with what we believe. Noah Justice does on screen narrating and it is very engaging! What an awesome job for a 16 year old! Of course this is not just for homeschoolers. It is a great addition to any science loving kids movie collection! I loved that we could visit each place without leaving home. We live on the east coast so getting to travel to these National Parks is just not in our budget. The DVDs allowed us to still experience the fun. Both dvds are also filled with lots of facts so you are bound to learn something new - even if you have been to either location! You can purchase your Explore Glacier National Park DVD or Explore Rocky Mountain National Park DVD on nlpg.com or on Amazon. Be sure to visit Awesome Science on Facebook for additional information. Don't forget to join the Masterbook Moms facebook party on March 25 at 7pm CST! You will learn more about the DVDs and have a chance to win some great prizes!! Such a nice sharing! This blog can be very helpful for traveller to learn about their detonations. Next month my uncle is going by bus to niagara falls from boston for a family tour and confused about his first family trip. Is there any DVD available about the attractions of Niagara Falls?